If not stopped, councils will be left as hollow shells while the looters get on with it. The only real source of revenue is the local taxpayer, who should have the final say. This source is like honey and attracts all kinds of hungry predators. Run the tricksters out of town and simply get on with the job of providing services, not indulging in high finance confidence tricks! The expensive-for-the-counciltaxpayer experiment by Goddard, Derbyshire et al now has to be reversed with care services being brought back in-house. of acute and residential care." Ye Gods and little fishes. They set this Schweinerei up, fail to monitor it properly and when it fails miserably they see it as a "tremendous opportunity". This is what we are paying Arms Length Management Organisation SK Solutions per month. Despite all the concerns regarding the following, Councillor Derbyshire, Leader of Stockport Council, again refused to respond to a question regarding financial irregularities of several million pounds at another SMBC Arms Length Management Organisation - NPS. And Councillor Derbyshire still refuses to respond to my questions regarding financial irregularities of circa £5 million at another Stockport Council Arms Length Management Organisation - NPS Stockport and she has done for circa 6 years. Is Councillor Derbyshire a fit person to hold public office? They will be tying up of £5 million of taxpayers’ money in an earmarked reserve to support SSK, which now cannot be used on frontline and priority services during difficult times and a sum which is equivalent to around 33% or one third of the Executives’ savings and cuts requirement for 2013/14. Click opposite to read an in-depth investigation into how the £4.7 million went missing. Again, Stockport LibDem Executive Councillors and senior council officers' financial and managerial incompetence shines though, to the detriment of the jobs of honest, decent local people. Interim reports into the £4.7 million loss. Read those censored reports and see all the blacked out parts. It appears that the main culprit was and remains the bizarre accounting procedures for work in progress and its completion and subsequent invoicing. The motivation is unclear but was likely to have been pressure to show a profit which did not exist ans which had to come to light in later years. However, it is generally agreed that severe systems/control weaknesses such as those identified at SK Solutions would always make the company or operation more vulnerable to fraud of any kind. Further, there should always be awareness of the danger of fraud in dealings with outside parties like suppliers, customers as well as questionable relationships between employees and outsiders. Why weren't the SMBC directors keeping an eye on what was going on? But the Managing Director of SK Solutions can still afford his two storey house extension, so all is well! These problems at Individual SK Solutions are in addition to the problems at Sk Solutions. What a dog's dinner this Council has made of running things! It is Council-owned. It was formed in 2009. It has not been performing to expectations. 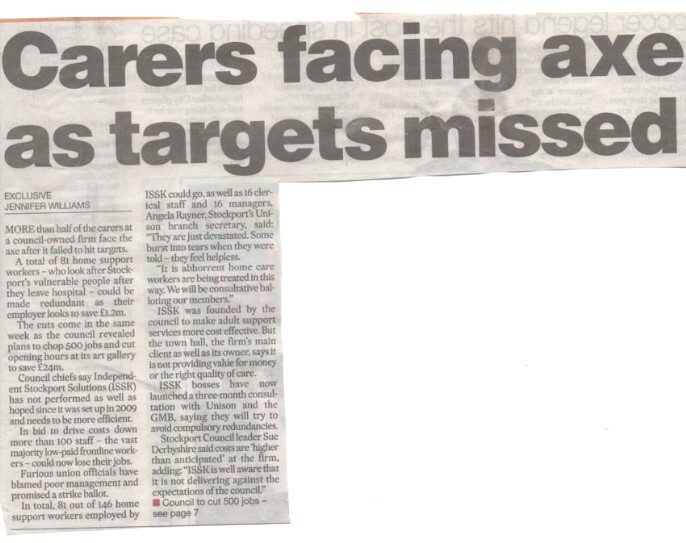 81 home support workers could go. Low paid, front line staff seem to be paying the price instead of those further up the chain. It needs to be more efficient. The unions blame poor management. Costs to be "driven down"
The founding objective was to make adult support services more "cost effective. Click opposite to see Solutions SK's 2010 accounts. Individual Solutions SK accounts 2010. Click opposite to see the 2010 accounts from Individual Solutions SK. Waste Solutions SK accounts 2010. Click opposite to see the 2010 accounts for Waste Solutions SK Ltd.
Care Solutions SK - no accounts available. Were there no interim accounts to ring warning bells? There was weak management etc. So, who hired them in the first place? The whole philosophy of hiving off operations which should simple be sharpened up in house, unless the real aim is privatisation with friends involved. Also, the same image of the separate legal entity is easily achieved by changin a few logos on vehicles and sites. At least "divisions" might have stumbled on the £4.7million earlier - but is that too much to expect? The Board of Directors are responsible for the strategic direction and success of the company. They are responsible for the delivery of a wide range of services and day-to-day operations across the organisation against the plans that have been agreed with Stockport Council. The Board meet on a regular basis to discuss strategic issues, policies and make key decisions. The Board is supported by three committees: Service Improvement, Nominations & Remuneration and Audit. The Service Improvement Committee is responsible for ensuring that Solutions SK Ltd continues to demonstrate improvements in service delivery, customer satisfaction and employee engagement. They meet on a quarterly basis. Decisions made by this Committee are reported back to the main Board for noting. The Nominations & Remuneration Committee consists of all Directors and they are responsible for leading the process for Board appointments and making recommendations to the Board. They are also responsible for agreeing the emoluments packages of the Executive Directors. This committee meets as necessary. Decisions made by the Nominations & Remuneration Committee are reported back to the main Board for noting. The Audit Committee meets three times per year to assess the adequacy of the company’s financial and audit arrangements and to ensure that the company’s published figures represent a true and fair reflection of its financial performance. Decisions made by the Audit Committee are reported back to the main Board for noting." 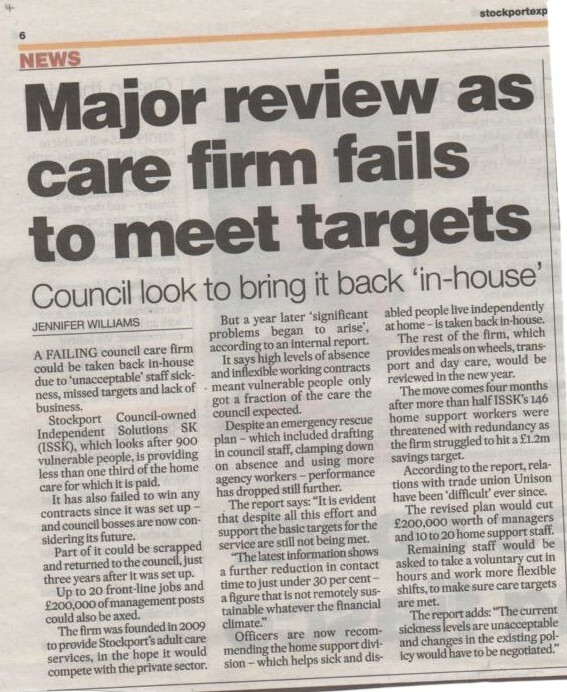 Sources include report to the SMBC Executive Committee meeting on 07/01/13 on proposal to return home support service of ISSK to Stockport Council. Transferring an operation from within a council to a company owned by the council but managed by the company's own staff. Teething troubles, initial setting up - relationship with the council - changing circumstances i.e., from those which existed at the outset but changed as time went by. The example is ISSK Ltd which was formed in 2009 to take over the functions of providing services (previously carried out by the council) to c 900 adults who required help at home; 200 staff were also transferred. Itr was hoped that the Council would bid for business from other councils. However this could not be achieved so long as the council was the direct provider. The separatedoperation at ISSK would remove this problem. The rationale for the formation of the company seemed clear. However, there were (more than teething ) problems from the start including pay structures. Original aims were not being met. Healthcare organisations were lookingmore and more inwards and therefore no further business contracts were obtained. This in turn led to an unacceptably low "contract" level compared to plan. This fell to 50% of expectation and is now as low as 30%. Result inevitable - difficult industrial relations made worse. However, this inward looking growth or "integrated locality" working and keeping more people in care at home seemed to present itself as an opportunity to get back and join this movement. 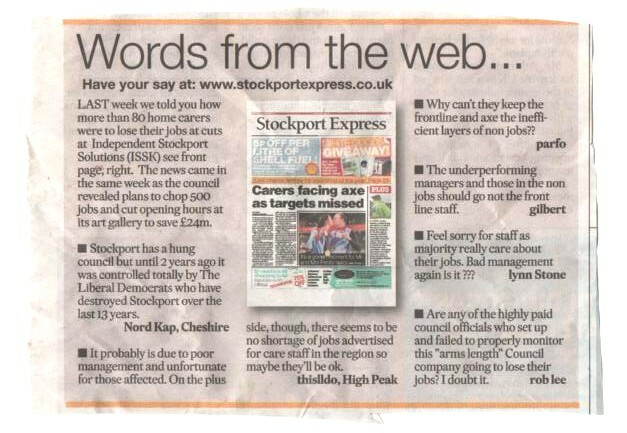 "Reablement" home support - the report only deals with this section of ISSK so that a successful reorganisation would leave behind transport, day care and community meals within a reduced company, the future of which is up for discussion between Stockport Council, the Board and staff of ISSK. Attitude of Unison generally. Even if the "return" were agreed and got going, would Unison be capable of deliverying the deal to its members? Are there any further benefits foreseen from returning the operation compared to the status quo. Comparing the effect of continuing with the status quo - would this be outweighed by the (potential) turmoil caused by the transfer back and integration? 5) Deficientcy of sophistication in management. Reablement has moved over the years from geneeral home support to a regime of specific focus on older people with complex needs. Adult social care (multi discipline) is heading for integration - locally based care. This surely weakens the case for operating through a separate company - weakening certainly from the level in 2009. Continue for the time being with a smaller company operating transport, community meals and daycare. Smaller is likely to involve higher administration - the legalities, compliance and dilution of expert management. Hopefully a complete solution will emerge in due course. It is rare to see a successful outcome from the transfer of a council operation into a separate limited company (with or withoiut the involvement of a minority interest). There are many and various reasons put forward for this constant failure. However, not least among these must be the rarified atmosphere of the civil service culture of senior staff of typical local authorities - hardly the ideal background for launching into the independent, rough and tumble of the private sector. A few notes on the protection of assets in a business environment. It is imperative that assets should be kept safe, in good condition so that they can serve their intended purpose. Obvious measures which are effective include insurance, security, good maintenance routines, for example. Recently, the miscalculation of stock values (a vital asset) and total confusion and misunderstanding of the principles by everyone from the shop floor to the boardroom brought about the total collapse of an SMBC subsidiary company. Also the staff have to be onside. However, to the main point. I was recently made aware that another asset in the shape of plant and equipment had been, over a long period, lost through theft and that a longstanding culture existed whereby such losses were looked on as the normal cost of operating. The"crime" scenes were outdoors - like roadworks or construction sites as well as within the business premises. Clearly, a simple inventory control system is the solution easily supervised and payback in a very short time, given the frequency with which preventable losses seem to have been incurred, not to mention the consequent disruption. No indication as to the scale of the problem other than it is significant, which sounds like a lot. Establish a maintenance schedule - frequency. Auditors will be involved; it will make their responsibility less heavy given the existence of a reliable system. Looking after the assets at SMBC - they are owned via the Council and should be protected and not regarded as fair game. This not only applies to equipment, tools and the like, but other assets like stock and work in progress. I recall the utter shambles which crippled SMBC satellite by misunderstanding the financial implications of lack of controls at SMBC and its subsidiaries.